The IBM 4694 Point of Sale (POS) Systems provide the advantages and choices available with today’s PC technology in systems designed specifically for retail. Utilizing standard PC technology provides the retailer freedom of choice in operating system, peripherals, adapter cards, network connectivity and system configuration. And since no two retailers are alike, the IBM 4694 family provides several different models, each with options, to allow the retail to customize the POS system to best suit their needs. The IBM 4694 is designed for both the network centric (thin client) and the Windows (thick client) environment with 32-bit and 64-bit architecture models, a range of processors and memory and a range of optional disk drives. 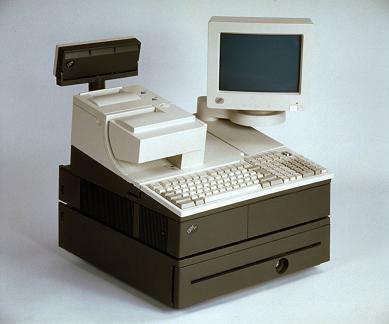 Maintaining IBM’s POS heritage of investment protection, the checkstands, networking infrastructures and most of the peripherals from prior IBM POS terminals operate with the IBM 4694. The IBM 4694 also offers a choice in physical size with narrow footprint (12.3 inches wide) and wide footprint (17.3 inches wide) models. The 4694-044 is a wide footprint model that comes standard with a 486SLC2 Processor, 2 Mb memory, and no hard drive.